With winter in full swing, we know a few of you are getting anxious to head out for some ice fishing. We’ve been watching the Minnesota fishing reports, and while ice depths are still varying, there have been promising numbers of walleye and jumbo perch action. Interested in a big catch this year? 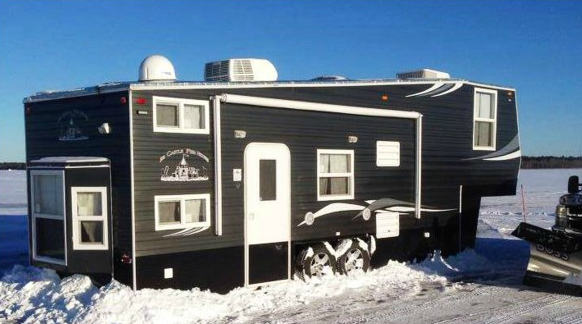 Then look no further than Bullyan RV and the all-new Ice Castle Fifth Wheel Ice House. With six lighted holes throughout the interior and superior engineering, this is a fish house made for extreme ice fishing. Ideal for the winter months, the Ice Castle Fifth Wheel is also installed with a roof top air conditioner, making this a fifth wheel for all seasons. Furnished with a 48″ dinette that converts into a bed and a 30″ top bunk, the Ice Castle Fifth Wheel offers a comfortable space to catch some sleep while waiting for to head out for your perfect catch. Braced for a flat screen TV, with mini dome tracking satellite system, and installed with four speakers, this spacious ice house has what you need to meet your entertainment needs away from home. The Ice Castle Fifth Wheel is outfitted kitchen space featuring a 3-burner cooktop, 6 cu. ft. refrigerator, and microwave, laid out with a practicality that makes meal prep a cinch. 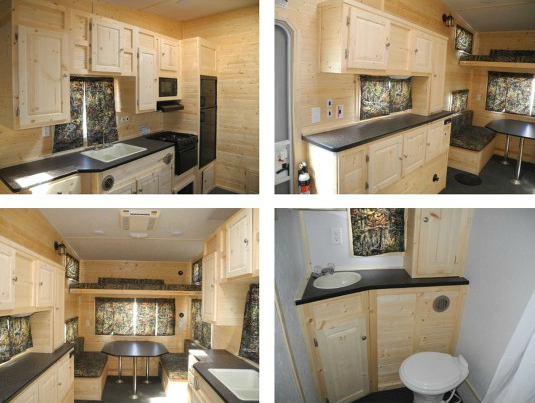 Decked out in a pine interior with raised panel cabinet doors throughout and accented with camo dinette mats and curtains, this is a rugged handsome space that will make you wish winter lasted all year long. Constructed on a dual axle frame, with a hydraulic lift system, the Ice Castle Fifth Wheel Ice House is a durable fish house that will last for years to come. Contact us today to learn more about this all-new model to an already impressive lineup of fish houses manufactured by Ice Castle.